"I go thus to infiltrate Firestorm Peak and bring back here a vial of the Starfire that burns yet deep beneath that cursed mountain. The Peak is swarming with Orc and Beast and Monster and whoever pledges to join me in this quest should have knowledge of secret paths and skills in espionage and shadows..." - Cleric Quinn, North Warden of Nimbar. For the 3rd Adventure in the RON campaign, My idea was to really up the ante in terms of scope, depth and gameplay. I wanted a pre-built dungeon which was not only larger but also slightly claustrophobic, creating the illusion of a dungeon under siege. 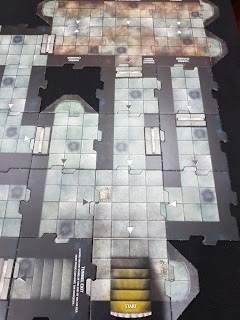 This would be a difficult adventure and to add even more complexity, I opted to use almost all of the Wrath of Ashardalon tiles and both Dire and Horror chamber tiles, each with a unique villain that would need to be defeated. Also Ashardalon would show up as an annoyance for increasing difficulty. Since our party will be up against some really tough odds I balanced it all off with 4 healing surges as well as some custom treasure cards built off the item tokens from Castle Ravenloft. Deep within the depths of Firestorm Peak there flows in narrow fissures the majestic Starfire which some say is the very essence of magic itself. For the Starfire flows from sources unseen and runs from the very soul of the world. It was this Starfire which was first trapped and wielded by the Mages of Old and forged into the Everlast. The Everlast! A powerful gem which created a protective barrier around the world called the Shimmer which kept the forces of chaos and evil at bay. Now the magic of the Everlast has faded and you and your party have come to Firestorm Peak to harvest the Starfire crystals and return the crystals to Astifoorn, the City of Stars, in order that the gem may be reforged and evil be driven back to the shadows. But be wary Adventurers, for the Peak is perilous and under siege. Dark creatures creep behind locked doors and foul Orcs and Abberants have infested the dark inner chambers. Also, Ashardalon is rumored to still walk the dark halls. Although old and scarred, the Dragon's breath is destructive to the delicate crystals so be warned! Goal: Infiltrate the 2 innermost chambers and retrieve the Starfire crystals from the broken fissures in the caves. Then, escape the Dungeon with at least 1 Crystal of Starfire. * Set aside the 'Tunnel Exit', 'Dire Chamber Entrance' and 'Horrid Chamber Entrance' Tiles. * You should now have a 22 tile dungeon stack remaining. Shuffle and split this into two equal halves of 11 tiles. * From the 1st stack, remove 3 tiles & shuffle in the Horrid Chamber Entrance and then place these 4 tiles at the bottom of the 1st stack. * From the 2nd stack, remove 3 tiles & shuffle in the Dire Chamber Entrance and then place these 4 tiles at the bottom of the 2nd stack. * Place the 1st Stack on top of the 2nd Stack. 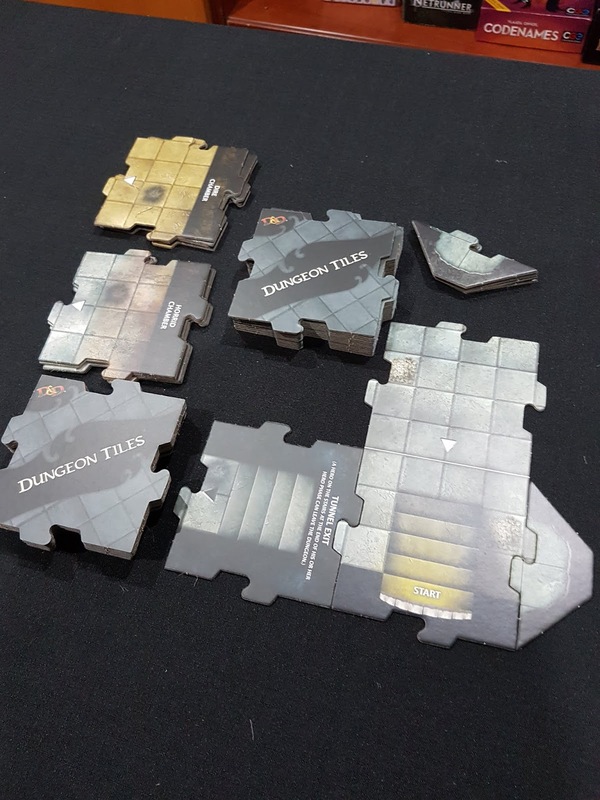 Your 24 dungeon tile stack is now ready. * Setup the Start Tile with the Tunnel Exit and one cavern edge tile adjacent to each as in the image below. Note the placement of the walls for the Tunnel Exit. * This adventure uses a pre-built complex. To create it, refer to the Ruin of Nimbar Adventure 1: Dungeons of Nerath blog post. 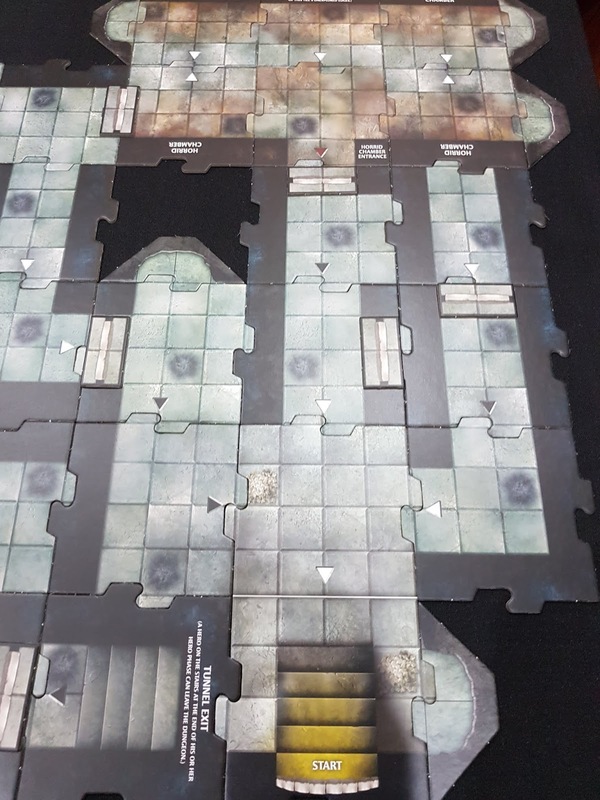 * Alternatively, you could setup the dungeon by referring to the Dungeon Layout Example photos below. * This adventure uses ALL the monster cards across the 3 games(LOD, CR and WOA). Remove the 'Drow Wizard' & Human Cultist monster cards from the deck if you are using these figurines for Aldred and Loth respectively. 1. When creating the pre-built complex, place a cavern edge tile on any unexplored edge after placing every 3rd tile. 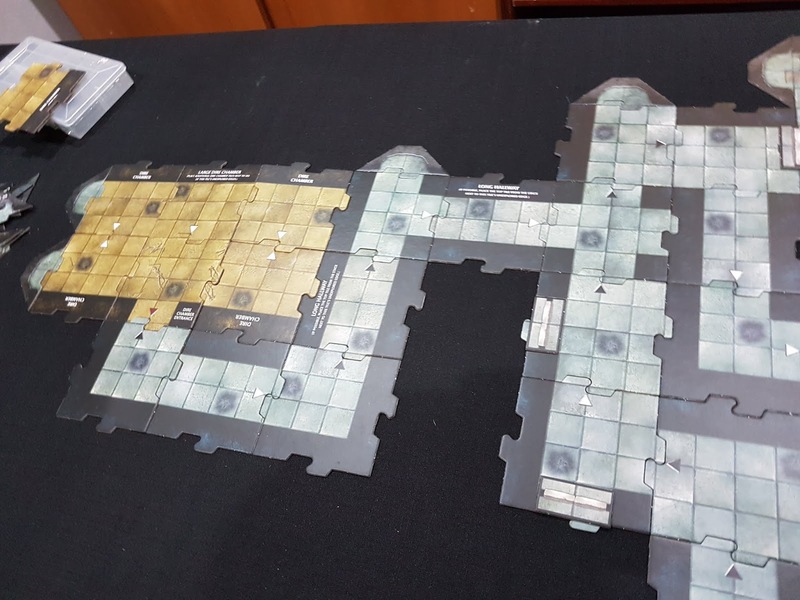 This creates the illusion of claustrophobia and a dungeon under siege. 2. When you reveal the Horrid Chamber Entrance, shuffle the Horrid chamber tile cards and randomly place them from the entrance. Ensure that the Chamber has only 2 entrances/ exits (use door tokens & the edge tiles). Place 2 x cavern fissure tiles on any unexplored edges of the furthermost chamber tiles. 3. Continue placing dungeon tiles, opt to create a 'circular style' dungeon and ensure that your tiles eventually join up with the Tunnel Exit tile (see below). 4. When you reveal the Dire Chamber Entrance tile, repeat step 2 but for the Dire Chamber tiles instead. 5. Place door tokens on tiles where required. 6. Place the Ottyugh Villain figure anywhere inside the 1st (Horrid) chamber. 7. Place the Orc Shaman Villain figure anywhere inside the 2nd (Dire) chamber. 8. Shuffle the special item tokens and randomly distribute them throughout the dungeon, placing one facedown on every 2nd tile if you like. Do not place any special tokens inside of chambers. 9. Place a monster token face-down on every dungeon tile after the star tile. Do not place any monster tokens inside of chambers. 10. Place 2 'Starfire Crystals' on each fissure tile inside each chamber (so, a total of 4 crystals per chamber). A new tile is explored by flipping over a monster token on a tile. Replace the token with the number of monsters (which could be anything from 0-4!). When moving onto a tile with a black arrow draw an encounter card. Encounter cards are not drawn inside of the 2 Chambers. Heroes adjacent to an item token at the end of their Hero phase may claim the item. Flip the token over and retrieve the associated custom Nimbar Treasure card. You may now use the item (or not). Follow any instructions on the card, if applicable. Victory: The Heroes win this adventure by escaping through the Tunnel Exit with at least 1 crystal of Starfire. Defeat: The Heroes lose this adventure if they fail to escape the dungeon with at least 1 Starfire crystal or if any one Hero is killed and there are zero healing surges left. "If we can get past these Abherrant demons and defeat the dreaded Ottyugh we should be able to harvest the Starfire crystals from the fissures in the chamber walls. But, we must make haste, there is a dark shroud about this place and I fear that something foul lurks within the shadows!" * Follow the Chamber rules from WOA and fill the chamber with Abberant Monsters for the Horrid Chamber or Orcs/ Trolls for the Dire Chamber. * Any Hero ending their Hero phase adjacent to a cavern fissure may 'attempt' to harvest a Starfire crystal by rolling a D20 to match the number on the fissure edge. * Alternatively, a Hero may spend a move action to harvest a Starfire crystal. * Remove the Crystal and place it on your Hero card. Any 1 Hero may carry up to 2 Crystals. * Whenever a Starfire Crystal is harvested, start the Ashardalon Timer. * Set 3 time tokens to one side of the dungeon. At the start of every new hero phase, flip over a time token. * Once all 3 tokens are flipped over, Ashardalon arrives! Place the Ashardalon figure 1 tile away from any Hero carrying a Starfire crystal. * For the purpose of this Adventure, Ashardalon has only 8 Hit Points. * Ashardalon attacks 3 times at the start of the next villain phase. * If Ashardalon manages to hit and wound a Hero carrying a Starfire crystal, remove the crystal from the game. * After Ashardalon attacks, remove the dragon from the board and reset the timer. * If Ashardalon has fewer than 3 hit points remaining, Ashardalon attacks 4 times instead of 3. * If the Heroes somehow manage to kill Ashardalon, the timer can be ignored. Curse that dragon! Ashardalon has cost us much by destroying our precious crystals but despair not. Our last hope at getting the Starfire rests now inside this Orc-infested Dire Chamber. Let us be rid of the Orc Shaman and his legions so that we may escape this dungeon and return the Starfire to Astifoorn! Through dangers, torment and great peril do our heroes escape at last the dread of Firestorm Peak and carrying with them the precious Starfire crystal and the hope of all Nimbar. Now can the Everlast again be reforged and the magic of the Shimmer restored but...the road to Astifoorn is now easy one and all paths to and from the Blessed Vale are being watched, Our heroes will have need of stealth and secrecy if they are to make it back safely to the city of stars.